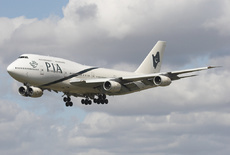 A PIA Boeing 747 sustained damage in heavy fighting at Karachi Airport, Pakistan. Pakistan Taliban gunmen had stormed the Karachi airport at night, disguised as policemen. Images also show extensive damage to the interior of the plane. It is said that the plane has been sold to a scrap dealer to be demolished. Bericht door Aircraft Maintenance Engineers.